Little, Brown And Company, Boston, 1988. First Edition. Fine cloth copy in a near fine, very slightly edge-nicked and dust-dulled dw, now mylar-sleeved. Remains particularly and surprisingly well-preserved; tight, bright, clean and sharp-cornered. 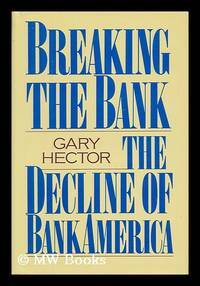 ; 363 pages; Fortune magazine writer Gary Hector tells the story of the 1980s decline of BankAmerica..